A winter weather advisory now in effect from 6p this evening to midnight CST Thursday night. WHAT: Snow expected. Total snow accumulations of 5 to 9 inches. A light glaze of ice accumulations expected for parts of northwest Wisconsin. WHERE: Portions of north-central and northwest Wisconsin and northeast Minnesota. WHEN: From 6p this evening to midnight CST Thursday night. ADDITIONAL DETAILS: Travel could be very difficult. The hazardous conditions could impact the morning or evening commute. precautionary/preparedness actions. A winter weather advisory means that periods of snow, sleet or freezing rain will cause travel difficulties. Expect slippery roads and limited visibilities, and use caution while driving. The latest road conditions for Minnesota can be found at 511mn.org, and for Wisconsin at 511wi.gov, or by calling 511 in either state. 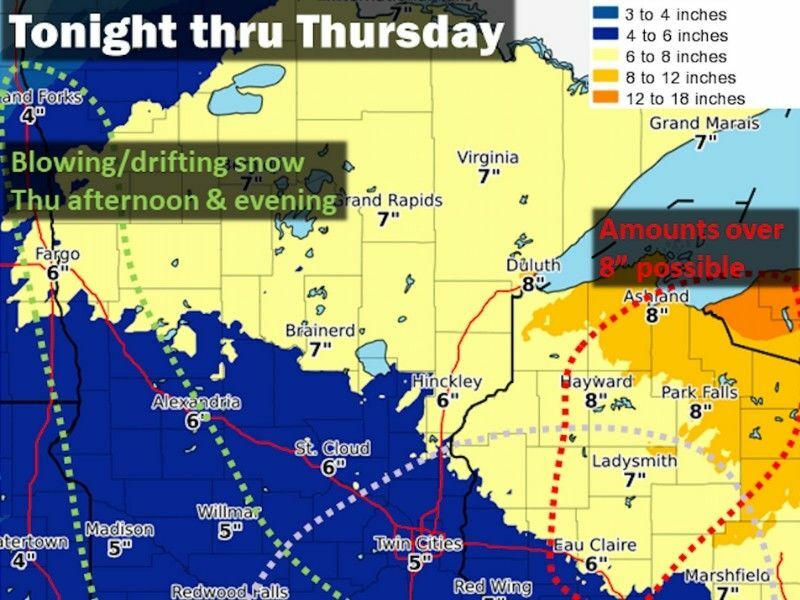 MORE INFORMATION: Snow at the head of lake superior early this morning. Widespread snow again late tonight into Thursday. Snow will continue to diminish over northeast Minnesota and into the Duluth area this morning. Expect additional snowfall amounts of 1 to 2 inches with locally higher amounts possible. Depending on the lake effect snow bands that have been observed, snow may continue through this morning. Another round of snow will spread in from west to east late this afternoon, with light to moderate snowfall rates continuing tonight and through the day Thursday. Total snowfall amounts of 4 to 8 inches are expected, but locally higher amounts are possible around the shoreline of western lake superior, especially along the south shore. A winter storm warning may be needed, especially for the south shore snow belt areas of lake superior.